Some gospel episodes are so irresistible that they end up in Bible books for kids, which may be the ultimate test of a story’s suitability for telling “the good news.” Preachers and Sunday School teachers get all the mileage they can from them. Pious folks who ‘love their Jesus’ can identify with this; getting close to the Lord was all that mattered, even if it meant digging though the roof. But once the afflicted man was lying on the floor in front of Jesus, the story takes a turn for the worse. Most believers don’t notice this…because they don’t want to. Yes, the story has its charm, but the same cannot be said for the theology behind it, or for Mark’s gospel as a whole. This is the second article in my series on each of the 16 chapters of this first gospel to be written; the introduction to the series, Getting the Gospels Off on the Wrong Foot, can be found here, and the article on Chapter 1 here. Have you been paying attention? If this were anybody else, we would say, “Such a blowhard”—claiming to heal someone to prove he had authority to forgive sins. But that’s a minor point. The implication of this story is that physical affliction is a consequence of sin, and that, once sin is forgiven, the body can be repaired. While we’re charmed by the image of a paralytic being lowered through the roof to reach Jesus, we shouldn’t suspend critical thinking, even though this is a beloved Bible story (well, especially because it is). It would be good to know where this story came from. Those who believe Mark reports “true stories”—i.e., that the gospels are history—never seem to wonder what Mark’s sources were. This gospel was written perhaps 40 or 50 years after the events depicted, so we need to know where and how Mark got his information—which is precisely what we don’t know; there is no way to gauge his reliability. Are these indeed the words of Jesus, or did Mark invent this script? One thing we do know is that the thinking reflected here—let’s face it, this is bad theology—has caused a lot of damage. It has seeped into Christian thinking that suffering is one of the ways that God punishes us. How much anguish have people suffered—on top of the pain of illness—because they’re sure that God is getting even with them? Double this anguish if people think that God is hurting others as well, to get even. “During this pastorate, our second daughter was born. My wife hemorrhaged following delivery, necessitating an emergency hysterectomy. She lost a lot of blood. There was no certainty she would survive. During a very long night at the hospital while she was in surgery, I wandered into the little hospital chapel in the wee hours of the morning. 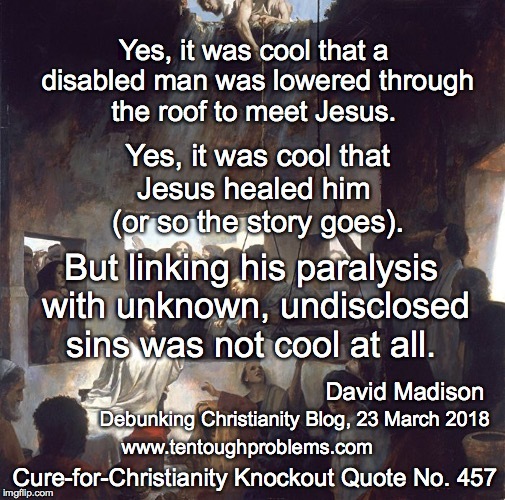 So yes, it was cool that a disabled man was lowered through the roof to meet Jesus; yes, it was cool that Jesus healed him (or so the story goes). But linking his paralysis with unknown, undisclosed sins was not cool at all. And, by the way, critical thinking wipes out taking the story at face value, i.e., the part about the paralyzed man standing up and walking away. We are obligated to weigh probabilities, not possibilities. What is more likely: that a Galilean peasant preacher eliminated neurological damage by a voice command, OR that it is a story that grew in the retelling over 40 years, i.e., it’s an example of full-blown folklore. Or it’s simply a product of a novelist’s imagination. As we make our way through Mark’s gospel we will appreciate that it is religious fantasy literature. At the end of this episode we read, “…so that they were all amazed and glorified God, saying, ‘We have never seen anything like this!’” There weren’t many critical thinkers in that crowd either. We find one of the most famous sayings of Jesus in the next episode in Mark 2. Jesus recruited the tax collector Levi to follow him, then went to his house, where he was in the company of “sinners and tax collectors.” When religious bureaucrats again raised their eyebrows, Jesus replied, “Those who are well have no need of a physician, but those who are sick; I have come to call not the righteous but sinners.” (v. 17) And, rightly so, this is one of the feel-good saying of Jesus. But Mark keeps the message vague. At the outset of the chapter, with all those people crammed into Jesus’ house, we read “…he was speaking the word to them.” (v. 2) And now, in the Levi episode, Jesus says that be had come to “call” on certain people. What was “the word,” and what was Jesus calling people to? Read the gospel of Mark carefully—and what’s missing? There is little focus at all on ethical teaching. Jesus’ primary message in Mark is the soon-to-arrive Kingdom of God…which never arrived. So, bottom line: “the word” was probably not moral teaching; Jesus was calling people to commit to his delusion. The Son of Man didn’t descended through the clouds, as was so enthusiastically promised and predicted as well by the apostle Paul. This is one of the big New Testament failures that the church has had to finesse. “Jesus said to them, ‘The wedding guests cannot fast while the bridegroom is with them, can they? As long as they have the bridegroom with them, they cannot fast. The days will come when the bridegroom is taken away from them, and then they will fast on that day.’” With this Jesus script, Mark introduces a theme that will be developed later, especially in Matthew 25:1-13, i.e., the Parable of the Ten Virgins. There, Jesus displays a nasty streak in his role as the bridegroom. This motif is part of Mark’s message about the coming Kingdom of God. In the final episode of Mark 2 we find another famous Jesus pronouncement: “And he said to them, ‘The sabbath was made for man, not man for the sabbath.’” (v.27) In this scene Jesus had been criticized because his disciples had been plucking grain on the Sabbath, which amounted to doing work. Hey, kudos to Mark/Jesus for this bold statement. This is a progressive outlook, after all, i.e., religious rules are made for the benefit of people, who are not created to conform to divine edict. Did the Galilean peasant preacher really claim this role for himself, and brag about it—as was the case earlier when he healed the paralytic? Was his ego that big? There were many other messianic pretenders in first century Palestine, so it wouldn’t be a big surprise. But it’s just as likely that the gospel writers molded the hero to fit their theology. They betray so little interest in history as they spin their fantasy literature. Please, believers, since Mark offers no clue whatever about his sources, don’t push the argument that his work “is reliable.” Read all his chapters several times, slowly, carefully; do the requisite nitpicking. Apply critical thinking to everything he’s trying to pass off in this not-so-thinly disguised theology tract.